The Carron Phoenix story began in 1759 when the Carron Iron Company was founded near the town of Falkirk in Central Scotland. 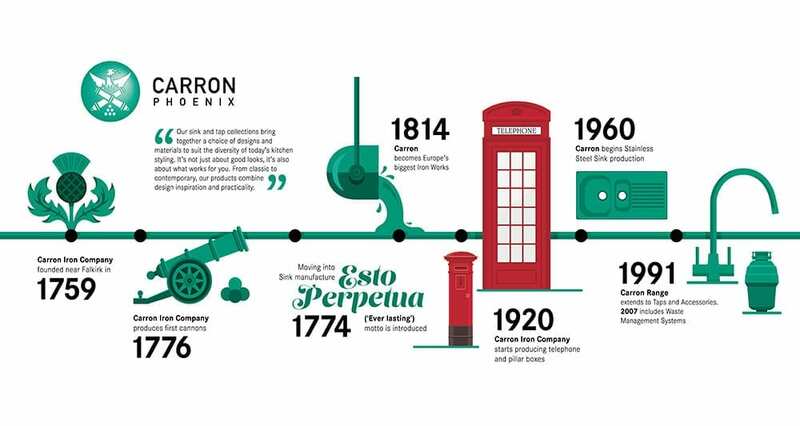 Famed for the manufacture of the iconic red telephone boxes and pillar boxes still in use throughout the UK today, the Carron Iron Company was considered to be the centre of the industrial revolution in Scotland and quickly became the largest iron works in Europe. Moving forward more than 250 years Carron Phoenix is now one of the leading manufacturers of kitchen sinks in the UK. Our sink design philosophy means that we do not compromise between stylish good looks and practicality. Whether Granite, Stainless Steel or Ceramic, all of our sinks are guaranteed for a lifetime, so you can be confident that they are of exceptional quality and are made to last. To complement the perfect sink, our extensive range of taps, accessories and waste management systems, gives you an all-round solution for getting the most from your kitchen sink space. Carron Phoenix manufactures products that are beautiful to look at and excellent to work with. Products that give you inspiration for your kitchen.